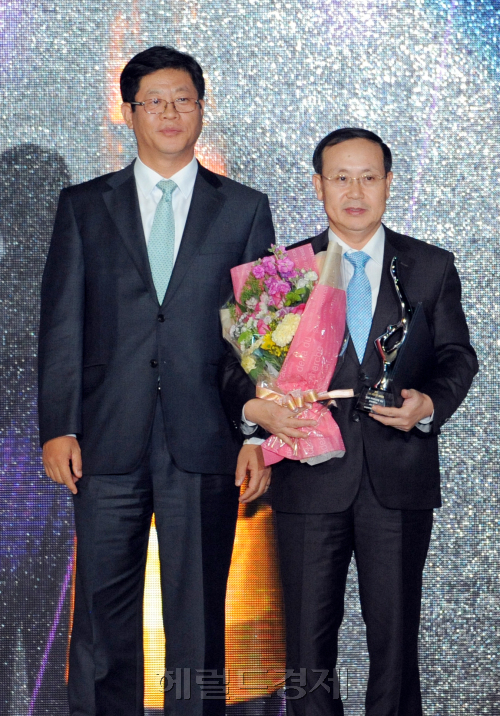 Jang Yoon-gyeong (right), director of Hyundai Mobis, and Kim Jae-hong, deputy minister of the Ministry of Knowledge Economy, pose for a photograph during the Donga TV 2011 Korea Lifestyle Awards held at the Grand InterContinental Hotel, Monday. Hyundai Mobis was awarded the Grand Prize. Hyundai Mobis won the grand prize on Monday at the “2011 Korea Lifestyle Awards” held at the Grand Intercontinental Seoul’s Grand Ballroom in Samseong-dong, southern Seoul. The leading auto parts maker was recognized for its development of the car multimedia system which appeals to future consumer trends. The award recognizes the company for having enhanced the status of the nation’s car industry by increasing exports. The annual awards which aim to honor groups and individuals that lead Korea’s contemporary lifestyle trends celebrated their 9th anniversary this year. The awards are hosted by Donga TV, part of the Herald Media group, and supported by the Ministry of Culture, Sports and Tourism, Ministry of Knowledge Economy, Ministry of Health and Welfare, Ministry of Gender Equality and Family and Seoul Metropolitan Government. Donga TV CEO Chang Yoon-young (left), actress Moon Chae-won and actor Cha Seung-won pose after winning the best-dressed award. The event started off with an impressive performance by pop star Kim Wan-seon and continued its glamorous stage with hanbok designer Park Sul-nyeo’s fashion show. Park was given the year’s culture and art contribution award. Celebrities like soccer player Ahn Jung-hwan and comedian Ahn Sang-tae showed up with their families at the ceremony decked in Park’s hanbok. Other grand prize winners include High1, a ski resort located in Jeongseon-gun, Gangwon Province, which came first in the tourism industry category; KB Kookmin Card in the childcare policy category; Pelicana Chicken, one of the most popular chicken franchises here, in the excellent food brand category; Kolon FnC Couronne, the fashion company’s accessories line, in the fashion brand category; and Industrial Bank of Korea which was awarded the grand prize for supporting multicultural families. In total, about 20 groups and individuals were honored Monday night, including cosmetics brands, hair brands, medical institutions, air carriers and food companies. The winners were selected after a three-step screening process ― an online survey on the Donga TV website; a second evaluation by professionals from the related industries; and a final screening. Many celebrities including actor Namgung Won and his wife Yang Chun-ja, actress Sa Mi-ja, child actress Suh Shin-ae and fashion designer Lie Sang-bong made appearances at the awards as well. The awards ceremony will air on Saturday at 7 p.m. on Donga TV.